Hortus Camdenensis | Rhodanthe manglesii Lindl. Erect, much branched annual with glaucous, oblong leaves and flowers varying in colour from pink to purple, with yellow disk-florets. Double forms are also known. To 60cm. [RHSD, Hortus]. ‘A beautiful, hardy annual, drawn by Miss Maria Curtis, at her father’s extensive nursery-grounds of Glazenwood, where it bears its brilliant rose-coloured and yellow blossoms in the early summer months. In July, Professor Lindley observes, it becomes shabby, and, by the beginning of August, its seed is ripe, and its life departed.’ [BM t.3483/1836]. Introduced to Britain in 1832. [JD]. 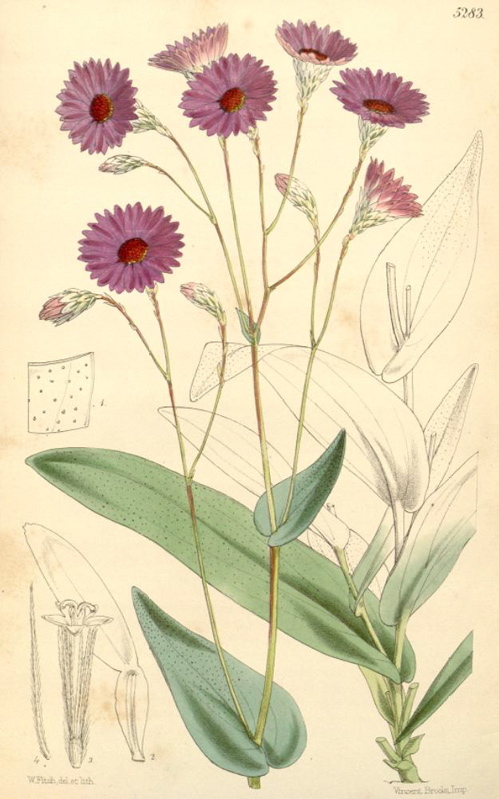 ‘Beautiful assuredly as this plant is, and different as is the colour of the flowers, especially of the disk, from the R. Manglesii (which has a rose-coloured ray and a yellow disk), and although it is cultivated as a distinct species under the name of Rhodanthe sanguinea in gardens, I can only offer it as a variety of that plant. That however published in 1836 is a very unsatisfactory figure, and destitute of analysis, which we are happy to have the opportunity of giving here. The original Rhodanthe Manglesii is made great use of in our gardens, in masses, for the ornamenting of our flowerbeds; and the present variety, whether mixed with that or kept separate, will prove a very valuable introduction. The genus belongs to a group of the Composite which, like the Xeranthemums are called everlastings, for the dried specimens retain the beauty of colour in the flowers as in the live state; and the group in Australia is remarkable for the variation of colour in the same type. Only one species is yet known to us, native of Western Australia.’ The variety figured is Rhodanthe manglesii var. sanguinea, the blood-coloured variety. [BM t.5283/1861]. BM t.5290/1862. BR f.1703/.1834.